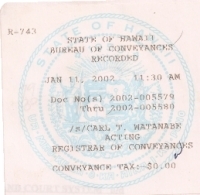 WHEREAS: This indenture, made on this day of , 2002, by and between direct Heir of Liloa ke kane O Akahi-a-Kuleana ke wahine hanau Umi-a-Liloa ke kane Piikea-a-Piilani hanau Kumalaenuiaumi ke kane, Kalanikupuapaikalaninui ke kane O Akahinui ke wahine hanau Kaleiwohi ke kane Majeity Akahi Nui, under duress P.O. Box 2845, Moku, aina O Wailuku, Mokupuni O Maui, Ke Aupuni O Hawaii, hereafter referred to as the "GRANTOR", which expressions shall include his heirs, executors, administrators and assigns. 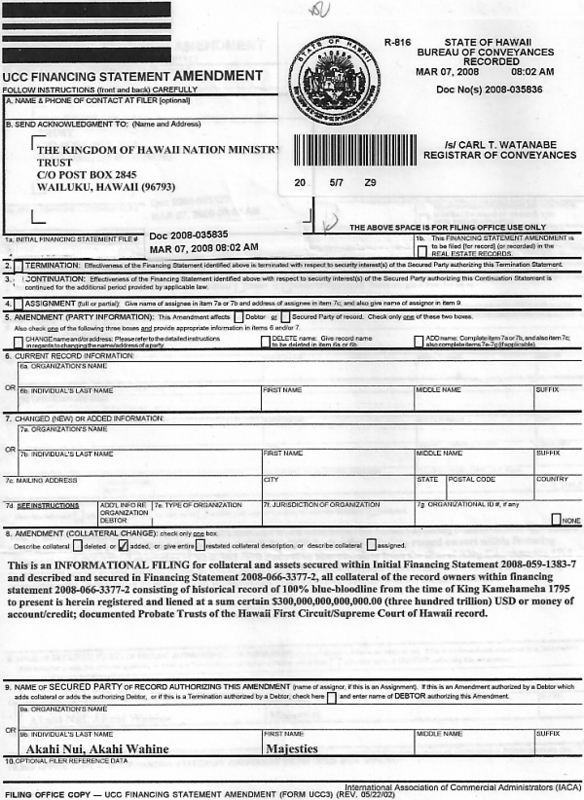 The Kingdom of Hawaii Nation Ministry Trust, Majesty Akahi Nui Trustee, whose address is under duress P.O. Box 2845, Moku aina O Wailuku, Mokupuni O Maui, Ke Aupuni O Hawaii nei, hereinafter referred to as the "GRANTEE". 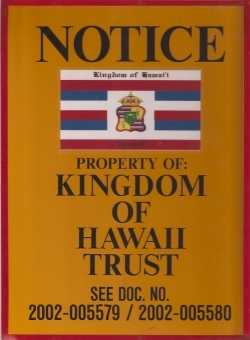 WHEREAS; That Grantor, hereby knowledged, does hereby grant, convey, and forever unto the Grantee, as tenant in severalty, all his right, Allodial title and interest in the Heir of Liloa ke kane O Akahi-a-Kuleana ke wahine hanau Umi-a- Liloa ke kane O Piikea-a-Piilani hanau Kumalaenuiaumi, Kalanikupuapaikalaninui ke kane O Akahinui ke wahine hanau Kaleiwohi, described T.M.K. 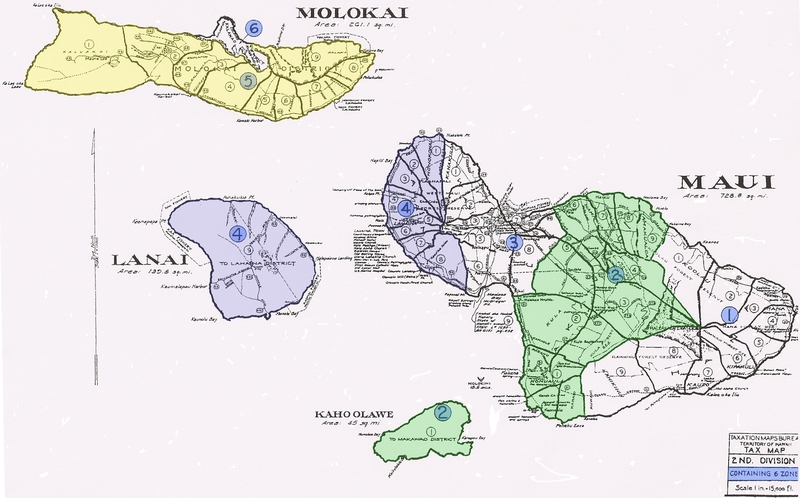 2 - 1 through 6 - All - All - All, in Royal scion Names of Allodial Crown and Government Lands, Na Ahupuaa, Na Ili, Kingdom Government Lands, Allodial Districts on the Islands of Maui, Kahoolawe, Molokai, and Lanai more or less. 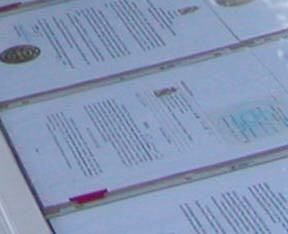 (see exhibit "A") and Writ of Prohibition. 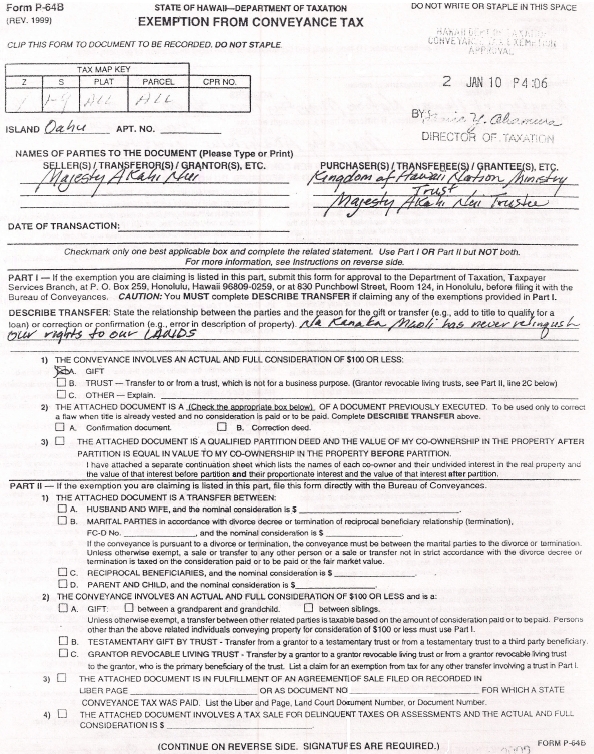 The terms "Grantor" and "Grantee", as and when used herein, or any pronouns used in place thereof, shall mean and include the masculine or feminine, the singular or plural number, individuals or corporations, and their and each of their respective successors, heirs, personal representatives and assigns, according to the context thereof. IN WITNESS WHEREOF, the Grantors Heir of Liloa ke kane O Akahi-a- Kuleana ke wahine hanau Umi-a-Liloa ke kane O Piikea-a-Piilani hanau Kumalaenuiaumi ke kane, Kalanikupuapaikalaninui ke kane O Akahinui ke wahine hanau Kaleiwohi ke kane, Majesty Akahi Nui Sovereign Heir have executed these presents as of this day of , 2002. WHEREAS: The Heir of Liloa ke kane O Akahi-a-Kuleana ke wahine hanau Umi-a-Liloa ke kane O Piikea-a-Piilani ke wahine hanau Kumalaenuianumi ke kane, Kalanikupuapaikalaninui ke kane O Akahinui ke wahine hanau Kaleiwohi, Majesty Akahi Nui Sovereign Heir. 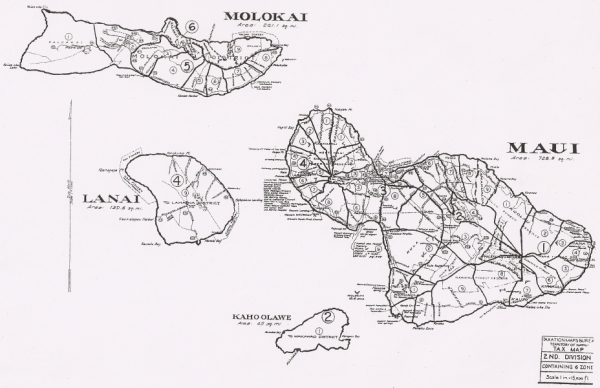 Allodial Land Titles have by his decision place unto the Kingdom of Hawaii Nation Misistry Trust and estate of Freehold Allodial, in and to the Land hereafter described, and whereas; Royal Scion Names of Allodial Crown and Government Lands, Na Ahupuaa, Na Ili, Kingdom Goverment Lands, and Allodial Districts on the Island of Maui, Kahoolawe, Molokai, and Lanai (see exhibit "A") Allodial Land Titles within described land commutation, relinguished by the heir of the estate. Containing T.M.K. 2-1 through 6 - All - All - All Royal Scion Names of Allodial Crown and Government Lands, Na Ahupuaa, Na Ili, Kingdom Government and Lands, and Allodial Districts on the Island of Maui, Kahoolawe, Molokai, and Lanai (see exhibit "A") Allodial Land Titles, more or less excepting and reserving to the Kingdom of Hawaii Nation Ministry Trust. WHEREAS: The Heir of Liloa ke kane O Akahi-a-Kuleana ke wahine hanau Umi-a-Liloa O Piikea-a-Piilani ke wahine hanau Kumalaenuianumi ke kane, Kalanikupuapaikalaninui ke kane O Akahinui ke wahine hanau Kaleiwohi ke kane, Majesty Akahi Nui. Sovereign Heir. 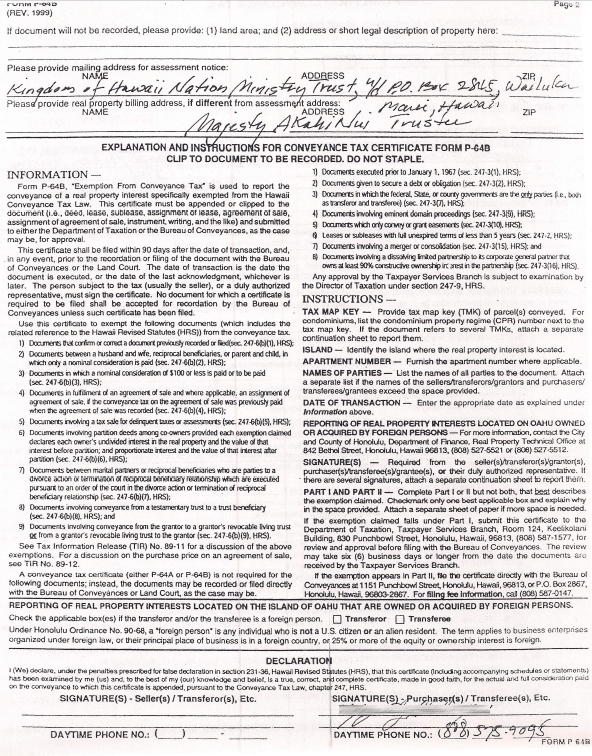 Allodial Land Title have by his decision place unto the Kingdom of Hawaii Nation Misistry Trust an estate of Freehold Allodial, in and to the Land hereafter described, and whereas; Royal Scion Names of Allodial Crown and Government Lands, Na Ahupuaa, Na Ili, Kingdom Goverment Lands, and Allodial Districts on the Island of Maui, Kahoolawe, Molokai, and Lanai (see exhibit "A") Allodial Land Title within described land commutation, relinguished by the heir of the estate. Containing T.M.K. 2 - 1 through 6 - All - All - All Royal Scion Names of Allodial Crown and Government Lands, Na Ahupuaa, Na Ili, Kingdom Government and Lands, and Allodial Districts on Island of Maui, Kahoolawe, Molokai, and Lanai (see exhibit "A") more or less excepting and reserving to the Kingdom of Hawaii Nation Ministry Trust. 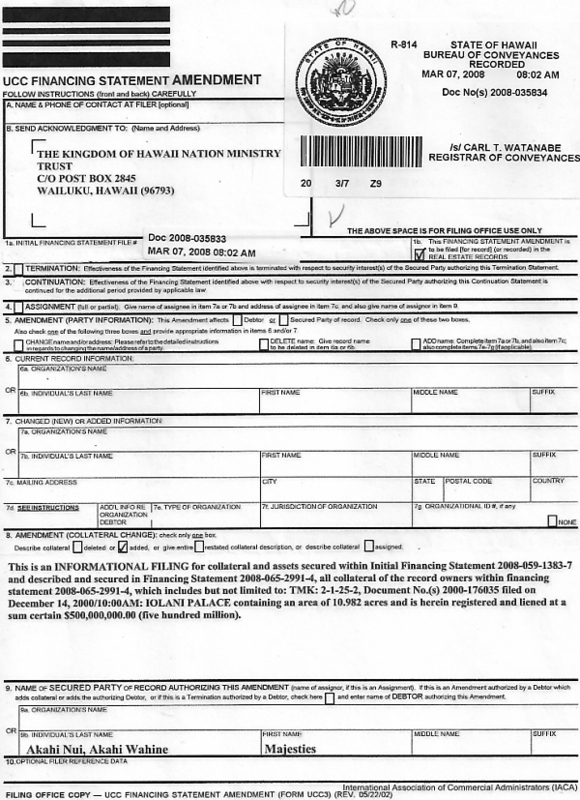 TO HAVE AND TO HOLD, the above granted Land in Allodial Land Title unto the said Kingdom of Hawaii Nation Ministry. Please submit a written request for a legal opinion to my office. Thank you. 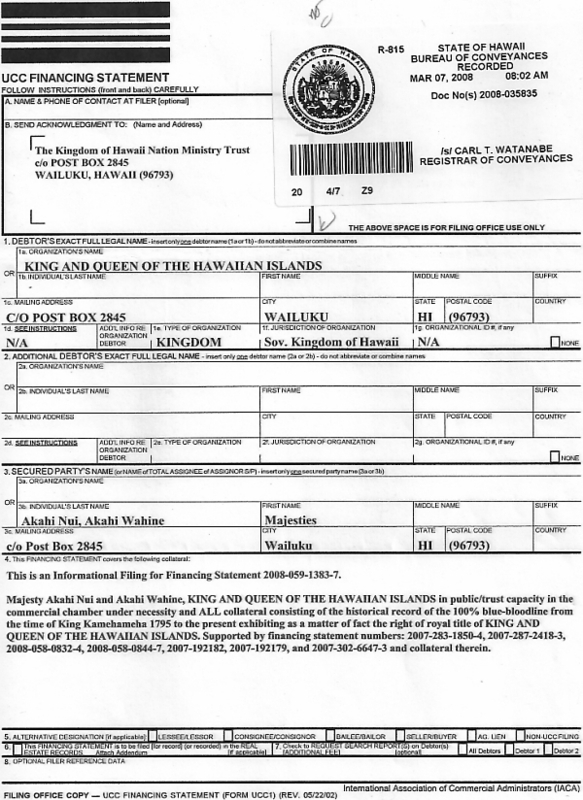 Mr. James Akahi with the Kingdom of Hawaii came in to our office yesterday and was inquiring about deeds that were recorded with the bureau of conveyances on Oahu, but have not have not been recognized by our office. He wants to know why our records are not reflecting these conveyances. From my understanding of this in speaking with our abstractor Bridget, she indicated that they were given a memo from Dennis *Ichikawa not to process these documents. Is this legal? Can you provide us with an opinion on handling this situation. Mr. Akahi will be checking back with me sometime this week or next. He said, if we don't recognize these recorded deeds, he will have to take corp counsel to court. Thank you for your time and consideration in this matter. I await your response.